Ambassador J. Christopher Stevens, US Foreign Service Information Management Officer Sean Smith and two CIA contractors, Tyrone S. Woods and Glen Doherty were killed in the attack. On September 11, 2012 a Libyan CIA safe house was attacked by a mob of angry Muslims. Ambassador John Christopher Stevens, his aide Sean Smith and two former Navy SEALs, Tyrone Woods and Glen Doherty, died in the assault carried out with rocket propelled grenades by a large terrorist force of 60 to 80 men of Al Qaeda in Libya, called Ansar Al Sharia. Five other consulate staff members were seriously injured in the attack on the CIA safe house. The mortally wounded Ambassador was taken to a hospital, we now know to have been under the control of Ansar Al Sharia. Dutch journalist @HaraldDoornbos had a scoop which led immediately to Congress sending a letter to the State Department, demanding clarification. The newly discovered documents he found in the wreckage of the mission revealed that the Benghazi police department had not responded to requests for more security during the visit of Ambassador Chris Stevens. On a Sunday after the attack Hillary Clinton's Ambassador to the UN, Susan Rice hit the talk show circuit with a number of talking points, asserting that at the root of the attack were "Muslims infuriated over the anti Mohammed video". Hillary was angered by the insult to "a great religion". Obama shared her view and went as far as declaring that in front of the United Nation's General Assembly. Then General Petraeus was fired as the Head of the CIA for "an extramarital affair". Early November Rep Rogers issued a subpoena for Petraeus to testify in front of congress during which Petraeus threw Obama under the bus. During the hearing it transpired Petraeus "clearly believed" the attack "did not arise out of a demonstration". The episode led to more questions than it solved: if Petraeus was under investigation by the FBI while in Afghanistan, why was he appointed CIA chief? Why did it take the Pentagon 19 hours to respond to the attack. Then another top General, John Allen was caught up in the scandal. In January, Hillary Clinton finally testified for the House Committee in an outrageous performance featuring awful acting, tearjerkers, fake rage and out right lies. She may well be known for the rest of her life for ejaculating in anger: "What difference does it make?" while she let the Jihadist cat out of the bag. April 24 saw a report which faulted Clinton for security lapses and claimed the White House changed Susan Rice's talking points. We now know there were as many as 12 revisions. The State Dept. removed all references to terrorism and Al Qaeda, emails between the administration officials show. The reason was to obscure the fact the attack was terrorist in nature. On April 20 a special operator with knowledge of the affair told Fox News in an exclusive interview the government had the ability to “react and respond” to the attack and could have had forces on the ground before the second wave of the assault began. Due to the explosive nature of his allegations, the special ops member remained anonymous (part 1, part 2) . On May 5 it was revealed the government had hired an Al Qaeda linked group to defend the Benghazi mission. That day the first member of the mainstream media jumped ship. Watch Bob Schieffer on Face the Nation! Eric Nordstrom, a diplomatic security officer who was the regional security officer in Libya, the top security officer in the country in the months leading up to the attacks. Gregory Hicks was instructed not to speak with a Congressional investigator by Sec. Hillary Clinton's chief of staff. When he refused, the State Department dispatched an attorney to act as a "minder". The State Dept. instantly gave a "blistering critique" of Hicks' leadership. He was subsequently "effectively demoted." Hicks called Rice's talking points "stunning" and "embarrassing." Hicks called the anti Mohammed video a "non-event" in Libya. He and others on the ground -- including Ambassador Stevens -- recognized the raid as a coordinated terrorist attack from the very beginning. Eric Nordstrom said that Clinton "absolutely" knew of his (and Stevens') repeated requests for an increased security presence in Libya. Furthermore, the Benghazi compound was operating below the bare minimum global security standard for US diplomatic missions. Stevens was stationed at the vulnerable Benghazi CIA compound on a dangerous symbolic date at the behest of Clinton, who wished to make that diplomatic mission a permanent outpost. A mortally wounded Amb. Stevens was taken to a hospital controlled by the Islamist extremist group Ansar Al-Sharia, responsible for the assault. Administration officials initially pointed to locals rushing Stevens to a local hospital as evidence of local goodwill from protesters. Both the President and the Prime Minister of Libya speaking to Hicks during the attack, defined it as terrorist in nature. They never referred to it as "a protest" over a video. Despite committee Democrats' repeated claims and leading questions, reduced funding had absolutely nothing to do with the inadequate security presence on the ground. During her Congressional testimony on Benghazi, Clinton memorably asked, "what difference does it make?" in regards to the provenance of the administration's incorrect talking points. Gregory Hicks and Eric Nordstrom both answered that question. Hicks in granular detail. Rice's talking points contradicted the view of the President of Libya, who had just said on national television the attack was a terrorist operation. This diplomatic spat resulted in the FBI obtaining permission to investigate the scene only after 17 days! It is not possible Obama could not have known about the attack. And when it was over, he went to Las Vegas for a fundraiser. The Commander-in-Chief simply abdicated his role as Commander-in-Chief. - The Washington Times: GAFFNEY: The real reason behind Benghazigate Was Obama gun-walking arms to jihadists? The morally defunct Democrat Party will do anything to stay in power. In the pomo world, winning at all cost is the name of the game! See how the Obama Administration changed its story about the terrorist attack over time. The Benghazi scandal has the potential to unseat both Obama and Hillary Clinton. Optimistic opponents would see Obama impeached and Clinton's chances as presidential nominee reduced to zero. The mainstream media are for the time being keeping mum about the cover up. CNN, ABC, CBS refuse to do their job. 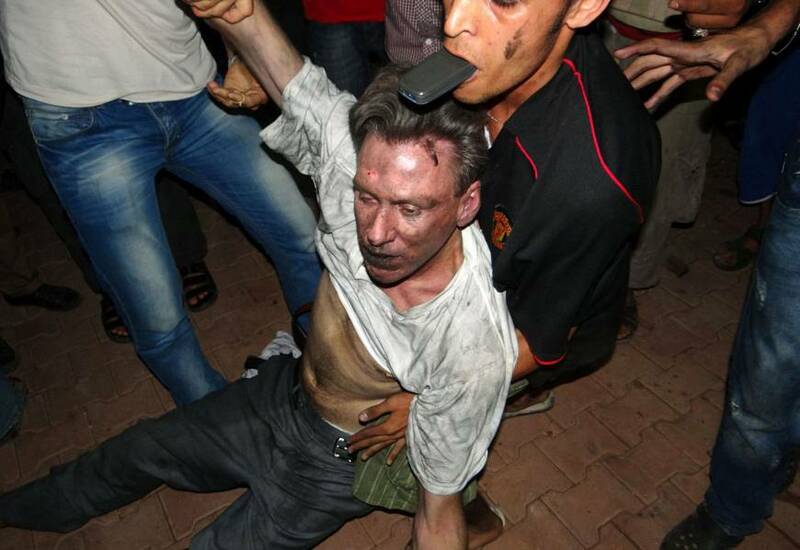 Pomoland shall continue to inform you about Benghazi Gate. Check our Live Blog that is updated as news is poring in.